This entry was posted on November 22, 2010 by iheartfilm. 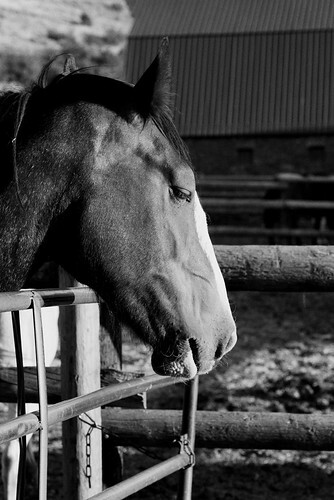 It was filed under Black and White, Ilford Delta 400, Portrait and was tagged with Black and White, film, horse, Ilford Delta 400, montana, nikon f100, noritsu koki, paradise valley, photography, Portrait. He looks pensive to me, somehow. Hehe, he was snoring away. You should have heard him. Excellent shot! He looks so alive to me in the photo, as if I could just step in and pat his head! Great composition. I like how the barn in the background mimics the pose of the horse with its down-sloping roofline and little windows. Photographic cubism! Lovely details on this photo! I have to learn how to shoot B&W this way. Oh how the black and white captures the texture of horse-hair in detail. Sweet. That’s funny Journey, I was thinking the same thing, as if he’s about to answer a tough question.